As many of you who read my Fashion Week posts know, I’m a major Marc Jacobs apologist. In my eyes, he can do almost no wrong and his main personal export is fabulousness. So it’s only natural that my huge personal bias towards His Excellency may be clouding my vision when I look at the Marc Jacobs Jeweled Stam Satchel. Because I was doubtful of it at first, but I seem to have somehow convinced myself that it is really fantastic, in a bling-tastic, bedazzled, Liberace sort of way. 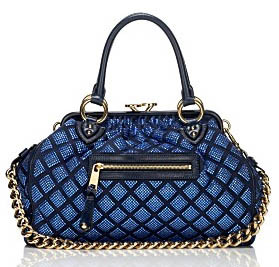 The bag’s quilts are covered in zillions of light blue Swarovski crystals against a backdrop of dark blue suede (may this be the first suede Stam?) with the traditional gold chain for even more shine. I think we all know that MJ is only continuing to make new versions of the Stam to capitalize on its former status as an It-Bag, but my 2005 black leather version is still one of my favorite bags, so I can’t hate on those that continue to snap them up. This particular wild-n-sparkly version would have to be for a very specific, very bold customer however, given its assumed ability to completely overpower anything else you’re wearing. I give Beyonce two weeks before we see paparazzi photos of her carrying it. Do your thing, girl. Buy through eLuxury for $2350.